Up in smoke: Why does Egypt keep burning its farm waste? Egypt's environment minister Khaled Fahmy has said that the toxic practice of burning rice straw at the end of the harvest season has reduced this year by 13-15 percent, Ahram Al-Arabic news website reported. The government has collected 79 percent of all rice straw from farmers after the harvest in 2017, Fahmy said. Complaints against farmers who burn their rice straw has decreased from 12,040 last year to 10,070 this year, Fahmy added. The minister's announcements came during the end-of-year conference at the Ministry of Environment to discuss the ministry's efforts to counter pollution. Burning rice straw after harvest season in the autumn results in the emission of toxic fumes that accumulate in black clouds in the sky. The cloud remains in the atmosphere for two to three months, potentially causing health complications for respiratory and heart disease patients, and could also trigger allergies and autoimmune diseases. Fahmy said that his ministry has been able to raise awareness about the issue through workshops for farmers in several governorates, and has used satellite technology to locate the sources of fires. The minister said that 2017 has seen the most success in four years in combating black clouds. The government is planning on supplying farmers with equipment to help them recycle rice straw, converting it into fertiliser and animal fodder to combat the rising costs of these goods, the minister added. On Friday, the ministry organised a two-day festival in Obour City east of Cairo to mark the end of the rice harvest season. 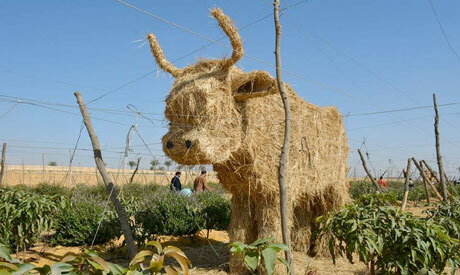 The festival featured displays of animal dummies made of rice straw, as well as other artistic performances. Rice is one of the largest crops grown by farmers in Egypt and is a key staple food for the vast majority of the country's population. The country's annual production of rice is around 5.1 million tonnes, much higher than the annual consumption estimated at about 3.95 million tonnes, according to a United States Department of Agriculture report. The land area used for rice production in 2017 was 704,500 feddans. The black cloud first appeared over the Nile Delta and Cairo in 1997, but did not become visible to the naked eye until two years later. Experts and environmentalists have blamed the cloud on straw burning during the rice harvest. Egyptians are sometimes forced to seek shelter indoors in the fall to hide from the negative health impact of black clouds.